Several years ago, when we were running our Guest House, a young Japanese lad used to come and stay with us regularly. Each time he visited us he would bring us presents. One time he gave us both cotton Kimonos. We have worn them endlessly ever since and they are reaching the end of their wearable lives. I was at the Festival of Quilts in Birmingham when I spotted the panel with the cranes on and thought what a lovely addition to a Kimono, and so the idea to make a new one was born. Luckily we were attending the show for two days, so that night I did some calculations and next day bought the fabric from Euro Japan Links. When I got home I used my existing Kimono as a pattern and hey presto, my new one was born. 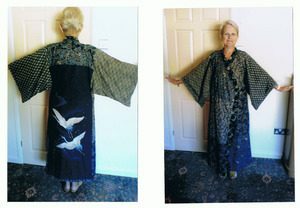 I learnt along the way that Kimonos are the shape they are because the fabric they are made from is hand woven in the home on small 14” wide looms. So all the fabric is 14” wide, on the sleeve the fabric is made as a tube and inserted, each front panel is one length, and traditionally one seam joining two pieces together to form the back.